DEB ROBERTSON WRITES....: Begone Winter Blues: some kitchen art! Begone Winter Blues: some kitchen art! I got the idea for this from this book. You just need an old cookie sheet and something to trace around the right shape. I found an old cook book in the opshop and thought it would be perfect for this project. It was fun finding pictures in the book that would fit into the wee circle. Like this cute coffee pot. And just a hint of a china plate. I used a bit of pva glue to stick the pictures in. I thought some of the recipes would look good too. I stuck it to my wall with double sided foam tape. It was an quick project and looks effective on the wall. You could do it for anything you wanted really. Cheers up the kitchen no end. OMG! That is a gorgeous idea, wow you are so clever, thanks for sharing. Now that certainly is different....I love it. 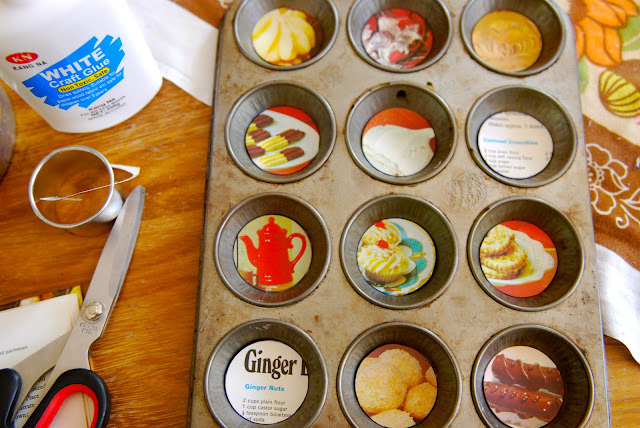 What a cute idea for an old muffin tin! What a creative little thing you are. cute - you always make the coolest stuff. it was lovely to see you today dear friend! oh, that really looks fabulous! well done! how cool! Those trays also work as magnet boards too - so you could pop up recipes with magnets on it too. Fantastic. This is SO ace!!! Oh that is such a great idea! Yours looks fabulous! If I can find any op-shops in Hong Kong, I am so looking for and old muffin tray!